When I was a teenager, which was a very long time ago, I had a problem with acne. As a teenager, you are already self-conscious, and so you want to make sure that you tackle acne from the beginning. I tried a whole bunch of different products, and none of them really worked for me. One night, while watching TV, I saw a product that claimed to be my answer. I was excited to give it a try because nothing else I tried worked. I ordered the product from the toll-free number and waited patiently for the product to show up. When I finally gave the product a try, I was startled by the results. The results that I got were . . . Well, let’s get to the results in a moment. Proactiv Solution has been around for a very long time. You probably have seen Proactiv’s infomercial, Youtube videos or seen an ad on the internet. The product was created by two American dermatologists, Katie Rodan, and Kathy Fields, and was put to market in 1995 by Guthy-Renker, a California-based direct marketing company. I was 15 years old at the time. Proactiv Solution is a three-step kit which includes a cleanser, toner, and lotion. It’s going to take you about 15-20 minutes each day to complete this process, so be prepared. Use the included cleanser to get rid of excess dirt and grime that’s hiding in the pores of your skin. Use the toner to kill the bacteria that causes breakouts. Use the provided lotion to repair your skin and reduce acne marks and scaring. The toner contains glycolic acid, an exfoliant, and witch hazel, an astringent. Inside the cleanser is a 2.5% concentration (The extra strength has 7%) of benzoyl peroxide. Benzoyl peroxide has been used to fight acne for a long time. In fact, most acne cleansers on the shelves at any drug store contain benzoyl peroxide in their products. Proactiv became very popular when celebrities began to use the product. These celebrities include Justin Bieber, Katy Perry, Avril Lavigne, Lindsay Lohan, Jessica Simpson, Jennifer Love Hewitt, Kaley Cuoco, Naya Rivera, and Julianne Hough. This list is just some of the people that Proactiv has used to sell their product. Some Celebrities used the product for themselves and saw results, but most of the celebrity support were paid endorsements on commercials and Youtube, but this didn’t stop people from trying the product. Sales began to skyrocket to 800 million a year as of 2010 with a media budget of nearly $200 million and $12–15 million for celebrity fees. Apart from all the hype, people started to use the product and found results. The results began to spread, and in time the product began to show up everywhere.I have seen Proactiv on the internet, on TV commercials, and Youtube. I’ve seen people selling Proactiv at kiosks in the mall and even in vendor machines. The product is everywhere that you look! I want to explain what I mean by that in just a moment. Let me answer it more directly first. 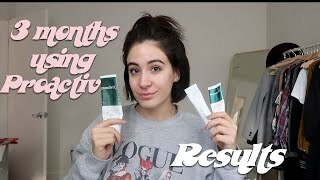 Does Proactiv work? Yes. It does work. There are two points that I want to make before you purchase the product for yourself. First, the results are so wide-spread that it’s hard to say that it works or doesn’t work, and it’s not for every situation. Proactiv Solution is designed for people with mild-moderate acne. It will not work with those suffering from severe acne. Proactiv Solution just isn’t strong enough to tackle this type of acne problem.If you are suffering from severe acne, I would suggest contacting a dermatologist and ask for a consultation. During the consultation with a dermatologist, you will be able to get individual help that will give you the support for your situation. Even though Dermotolisgst created Proactiv, and it has been marketed to death, it’s still just an over-the-counter acne cream. It’s not going to solve all of your problems that’s for sure. Take all the media flare with a grain of salt, and be patient with the process. 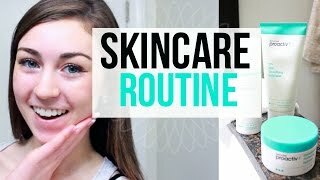 When I read through the countless reviews of those that have tried Proactiv, I found that there are so many different opinions about Proactiv as a product. Some people say Proactiv Solution solved their acne problem for good, and that after using this product they never had a problem again. Others say that they wasted their money and that it didn’t help at all. Everyone’s skin is different, and that is going to have a significant footing on the outcome of this product for you. My teens love this product! I tried Proactiv when I was a teen and found mixed results. My acne did dry out and went away, but it may have been the fact that I was watching my face a lot. I didn’t have really bad acne, so I am not a good example. The product has been around for a long time, and that says something. It must be working for some people or it would not have lasted so long. I do say that this product is a lot of hype and that you need to purchase this product with the understanding that we are all different and it may not work for you. I hope that this review has helped you. Leave a review below if you have something to share about using Proactiv. Proactiv is a anti-acne solution that has been on the market for a long time. It’s used by teens and adults to tackle stubborn acne problems. Productivity - Does It Make My Task Easier?